ANDERSON, Steve died on May 3, 2018 after spending the day on the east end of Santa Cruz Island hiking with his wife. He collapsed and died on the Island Packers' boat returning from the day trip. May 29, 2018 [CarDesignNews]: “Remembering Steve Anderson. We are very sad to report the sudden passing of Steve Anderson, one of the most respected, talented and accomplished design leaders in the Southern California automotive design community.Earlier this month, he passed away suddenly from heart failure while and his wife Kerry were returning on a ferry after a hike on Santa Cruz Island on their 27th wedding anniversary. Steve was just 51 years old. 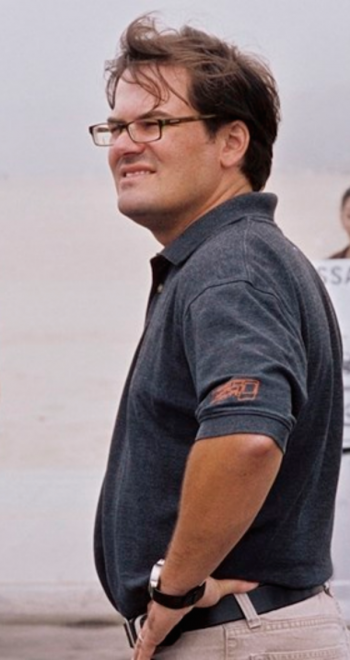 Steve’s first and significant design achievement was as a young designer at Volkswagen Simi CA, working on the Volkswagen Concept One Showcar that was introduced at the 1994 Detroit Auto Show. On this project, Steve worked with Jay Mays, Franz von Holtzhausen, Derek Jenkins, Freeman Thomas, and many other talented pioneers in the Southern California design community. Verena Kloos, the Director Design for the studio at that time commented, “I will always remember him as a loyal and responsible person. He was the first designer I hired from Art Center.” Steve later went on to finalize the production design version of the New Beetle in Germany. Steve moved to Nissan Design America in 1998 and made significant production contributions to the 350z and the Titan exteriors.